How to treat Grey Scale aka Why is my skin mad at me? Ever since I started trying more products, I’ve noticed that there’s a massive difference between things my skin likes and things my skin doesn’t like. 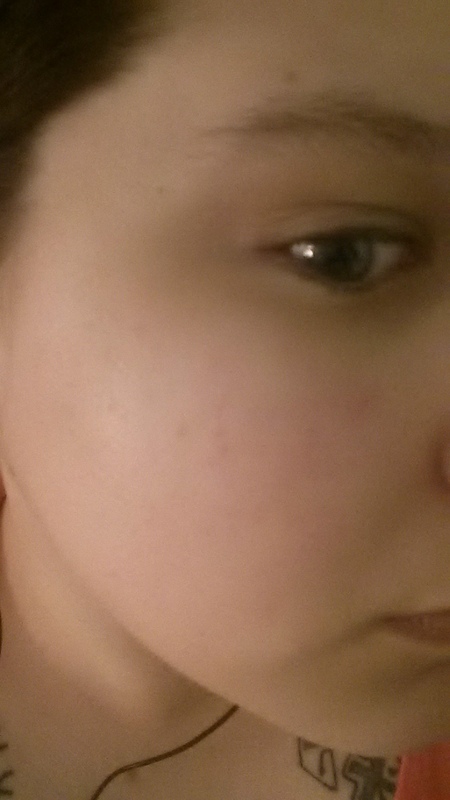 However, on rare occasions (twice) my skin has gone beyond looking a bit dull or getting a few pimples. Burning red cheeks, a layer of dead skin on top, and bumps from trapped pore gunk. It’s not my best look. It’s so unflattering that I’ve decided to call it grey scale. But what do you do when you’ve developed a reaction like that? Photo is showing the early stages. Red bumps, tightness, dryness. Firstly, is it really grey scale or is it just a bit fickle at the moment? Well, is it sudden? A significant change? Without any other cause such as hormonal variation, medical treatment, change in climate? Has it become painful to touch your skin? Is it visibly red? Spots appearing in places where you don’t usually get spots? Visibly dead skin on large parts of your face? Is it showing no signs of improvement after a few days? Yeah, it’s probably grey scale. Step 1: Identify the cause. This is an allergic reaction more or less. There is something in one of the things you’re putting on your face that shouldn’t be put on your face. Very scientific, I know. If your skin is sensitive, watch out for alcohol and certain preservatives as they can be very drying for the skin. In my case, I also know to stay away from collagen boosters and honey. I know, one of the supposedly best home remedies in the world and my skin throws a fit whenever I use it. Have you added a new product to your regimen? Has the product you’re using had its formula changed? In other words, what has changed to cause this? Step 2: Eliminate the cause. Stop using the product immediately once you think you’ve identified the culprit. If the problem has worsened gradually, the it is most likely a product you’re using every day. If it has flared up, then you’ve probably had an immediate and quite serious reaction to an ingredient. I’m currently sitting here with a sheet mask on because I noticed my face was so dry it was itchy. After having eliminated the product I think might be causing this, I am now focusing on emergency relief. Throw some moisture in there, maybe something soothing. However, don’t go crazy. Use one mask, or one gel. Don’t go throwing new “miracle cures” on it. Shea butter is good, as is aloe vera, kelp, and mung beans. Go basic. Only do this if you have reached the point where you’re experiencing physical discomfort and are 100% certain it won’t make the problem worse. Your skin needs space to heal and recover. Don’t bring in any new products until the problem is gone. Stick to a mild cleanser, a mild toner, an essence for sensitive skin, and a moisturiser. Don’t add an extreme hydration sleeping pack thinking it will heal faster. Do not exfoliate straight away, give it some time to build some resilience before you start removing more skin cells. Make sure to double check the ingredients lists and ensure that you’re not using a product that contains even the tiniest amount of whatever you’re reacting to. You might normally be fine to use a cleanser with a small amount of alcohol, but after the alcohol in your new toner triggered this, your skin will be extra sensitive to this ingredient. Again, remove it completely. Skin doesn’t actually breathe, apparently some people believe that it literally breathes. However, it does sweat. You don’t want to wear heavy makeup when your skin is healing. Nor do you want to use makeup that will require a lot of remover to… remove. Stick with a cushion foundation since it also contains spf. Forget concealers. Forget contouring. Forget anything that involves going over the affected area multiple times. You might want to consider entirely skipping makeup and just using a moisturiser with sunscreen. Don’t be tempted to cover the problem with tons of product, it will only take longer to heal. If you’ve correctly identified the harmful ingredient, your skin should improve significantly at a very rapid pace. Within a week or so, you should be fine. Be patient, don’t put your skin through too much stress (pool water, air planes, heavy sun exposure, rapidly changing climates), and don’t touch it. Seriously, don’t touch it. Your hands have plenty of bacteria on them throughout most of the day and you don’t want to be risking infections. When your skin is completely healed, you can go back to your normal routine (of course not using the ingredient/product that caused it in the first place).